• The detailed step-by-step directions make it ideal for use by students who are conducting their first research project. • The large number of examples throughout the text makes the steps in conducting a survey clear and easy to follow. • Covers only methods that are realistic for use by students who are conducting a survey within a single semester. • For data analysis, the emphasis is on the use of basic statistics, with the computation of a small number of descriptive statistics illustrated. Easy-to-calculate margins of error are also illustrated. 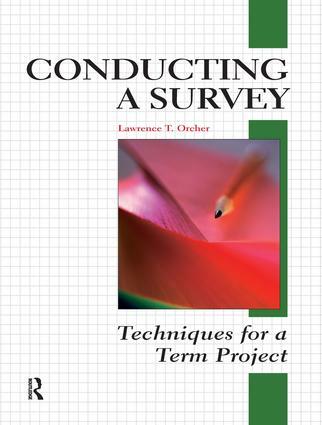 • The firsthand experience of conducting a survey as a term project helps students understand both the contributions and limitations of survey research methods. • Successfully conducting a term-project survey can give students the confidence to work on more elaborate studies in the future, such as research for a master’s degree project.